It’s hard to believe that Ellen DeGeneres turns 61 this week — the talk show host seems to have bottomless energy (not to mention flawless skin). So many of us have watched her throughout our lives, from her beginnings as a stand-up on our favorite late-night shows to the incredibly brave moment she came out on her own television series to just last month when she made history again with her $20 million Netflix special, Relatable. All in all, she’s won 30 Daytime Emmys, 20 People’s Choice Awards and a Presidential Medal of Freedom. She’s also the second-highest-earning TV talk show host in the country. Why has DeGeneres been so popular over so many decades, and how has she been able to make such huge strides for female comedians and the queer community? Not only is she hilarious, but she’s also sincere — and has an amazing ability to connect with everyone, from the insanely famous to the everyday person, on her show (which has been running for a whopping 16 seasons). While she’s known for a few big career-defining moments, the moments she really connects with us are smaller but just as important. Let’s take a few minutes to remember all the reasons DeGeneres is still dominating daytime and beyond. DeGeneres has gone out of her way for many, many years to help protect animals and their rights. A vegan for many years (she now eats the occasional piece of fish or egg), one of DeGeneres’ greatest heroes is conservationist Dian Fossey. Once, when she hosted the Oscars in 2014, she donated 200,000 meals to animals in shelters. More recently, her wife, Portia de Rossi, gave her the Ellen DeGeneres Wildlife Fund to continue her charity to our nonhuman friends. In 1989, DeGeneres was the very first female comedian in history to get invited to sit and talk to Johnny Carson after her stand-up performance on his show — it had been a goal of hers since she started out as a comedian. Since then, she’s smashed through tons of glass ceilings for female comedians. Most recently, she became the first women to land a $20 million comedy special on Netflix. We’re all used to watching celebrities sitting on talk show couches and telling prepared stories while also hyping their newest project, show or movie. But when celebrities visit The Ellen DeGeneres Show, they seem to open up and act like real people having real conversations. They also often seem like they truly, really like and respect DeGeneres as a person and a friend. Don’t believe us? Watch this clip of Kristen Bell opening up about her love of sloths. A huge part of DeGeneres’ popularity is her authenticity — and she’s learned that lesson throughout her life the hard way. Her success only started to come when she started to share who she was with the world openly. Even though coming out initially stalled her career (her hit sitcom ended shortly after), it has only helped her in the long run. She’s so relatable because she’s so honest, and it’s something that shines through everything she does (and everything she teaches others). After you’re done watching the above inspiring speech she gave at Tulane, there’s also this amazing acceptance speech she gave at the Teen Choice Awards when she won for best comedian. 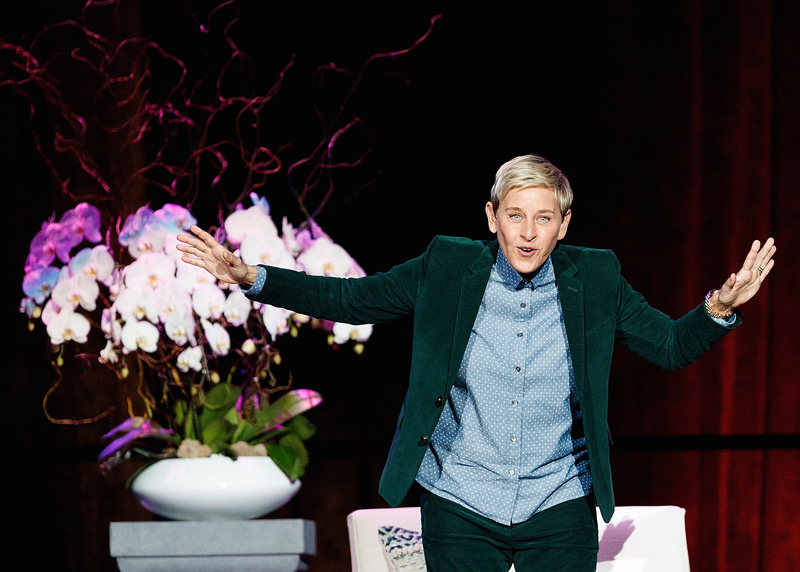 DeGeneres has long been known as one of the most fan-friendly celebrities. Not only does she shower her fans with gifts during her talk show, but she often surprises them both in and out of the studio. Above, check out how she surprised this 9-year-old superfan. Ten years ago, DeGeneres sent an important message to her audience about bullying, acceptance and gay pride, following the death of 18-year-old Tyler Clementi, a teen who died by suicide after he was outed as gay. She ended the message with, “Be kind to one another,” and a decade later, she still signs off with the same message. It’s one most of us need to hear every day. She also practices what she preaches. One of the most well-paid celebrities in the country, she is almost constantly giving away her wealth and helping others through benefits, organizations and fundraisers. Just in the last few years, she’s raised $1 million for a children’s hospital, helped with Hurricane Harvey relief and given $500,000 to a school in Detroit badly in need of repairs and supplies. So many people say they love DeGeneres simply because she brings joy and happiness into their lives — her show is often not just funny, but uplifting and optimistic and fun. Nothing embodies the tone and atmosphere of what she does better than her dance moves, which she’s been rocking since the earliest days of her show’s success. Try not to smile when she’s cutting a rug. The only thing DeGeneres loves more than a surprise is a prank — and she especially loves pulling them on celebrities. So many have been pranked over the years, but our all-time-favorite is probably still the time she made Dennis Quaid say a bunch of crazy stuff to a tow-truck driver. Or maybe the time when she made Bruno Mars pretend to be sick. You can watch both on the video above. Twenty years ago, DeGeneres made history by coming out. On her sitcom, Ellen, the character she portrayed became the first main character to come out of the closet, and at the same time, she herself announced that she was gay. But that’s just where her impact regarding LGBTQ rights started. Since then, she’s been an outspoken supporter of marriage equality (and against Proposition 8). She’s also somehow taken mountains of criticism for her sexuality with grace, thoughtfulness, kindness and humor. While she faced backlash for defending Kevin Hart when he stepped down from his Oscars gig after homophobic tweets resurfaced, she continues to be an icon. Last but absolutely not least: Ellen DeGeneres is one of the greatest comedians of our time. Although it can be easy to think of her as a talk show host or a celebrity or a do-gooder, make no mistake that she’s a seasoned, adroit stand-up comedian who can go shoulder-to-shoulder with the best of them. The No. 1 reason she is in our hearts — and will always be in our hearts — is because she makes us laugh.